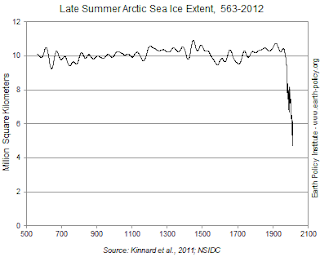 Chris Searles Writes Here: "Arctic Sea Ice in Free Fall"
"Arctic Sea Ice in Free Fall"
"The North Pole is losing its ice cap. 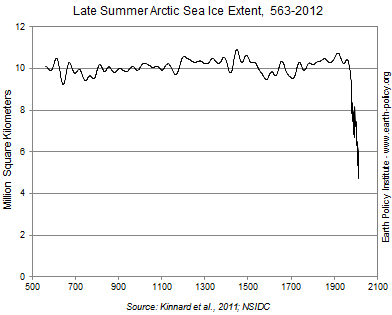 Comparing recent melt seasons with historical records spanning more than 1,400 years shows summer Arctic sea ice in free fall. Many scientists believe that the Arctic Ocean will be ice-free in the summertime within the next decade or two, and some say that this could occur as early as 2016. " -- Earth Policy Institute. See the rest of this report here.